Spend less time playing phone tag and email tennis trying to schedule interviews, and more time placing the right candidates in the right positions. Sync with other calendars: automatically block unavailable time based on your personal calendar or your client’s calendar. You can also display your appointments in Google Calendar, Outlook or iCal. Complete access control: enable candidates, staff and management to view and use your schedule the way you want them to, while keeping details of other bookings private. Customizable notifications: customize and send email or text confirmations, reminders and follow-up notifications. Add attachments to your email, such as personal data forms with instructions. Integrates with your website: embed your schedule or add a link to make it easy for candidates or staff to make an appointment; or design your own standalone schedule. On the move: optimized for both mobile and desktop use so that you manage your online interview schedule from anywhere and on any device. What can you do with SuperSaaS? Set up easy integrations. Make it easy to schedule interviews between candidates and clients by connecting with your client’s Google Calendar so that their availability reflects in your schedule. Create forms. Capture candidate or staff details at registration or when booking, which can be exported to Excel or connected to other services such as your CRM system. Add payments and extras. If you offer specialized services, such as résumé design or interview coaching, you can add prices and take online payments. Change layout and branding. 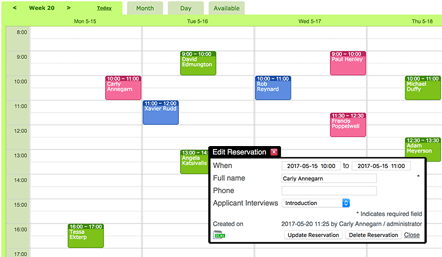 Customize the color scheme and layout, add your logo and present your online interview schedule with your own branding. Grant special access. When you’re too busy to keep track of your schedule, you can assign superuser and management roles to enable your team to assist you. Select custom features. Simple configuration steps show you how to customize the entire booking process and specify who can create, update or delete bookings. My small business recently had an overwhelmingly successful promotion in which we were flooded with incoming requests for appointments. Without the SuperSaaS scheduler I would have had to hire staff just to handle the scheduling which would have taken at several weeks. SuperSaaS was up and running smoothly in 15 minutes and fully integrated into my site, in style and format, in about an hour. Our staffing organization had always scheduled appointments the manual way – through calls and email. What a lifesaver SuperSaaS has been. In the months we have used it we have saved time and resources. The schedule is easy to administer and easy to use. I recommend this product for all looking for an appointment scheduling solution.